How rare it is to come across a building as such as this in Wilmette, Illinois. Located on a prime piece of property on Lake Michigan, this historic home was slated for demolition as once again the property and location out valued the home. 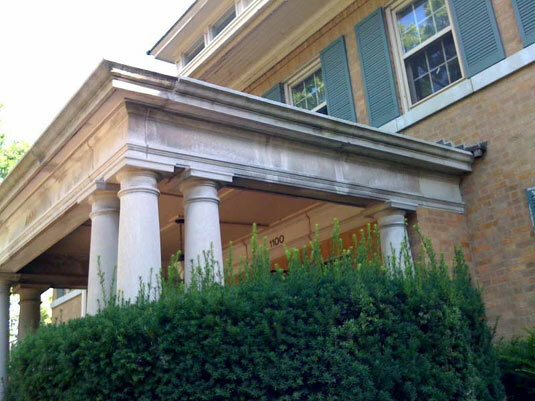 We fell in love with the wonderful limestone that framed out the entrance. Limestone is known for its durability, strength and its wonderful texture which seems to improve with age. There’s really nothing like it! As we hate to see anything end up in a landfill and are always seeking a challenge, the decision was made to save these one of kind pieces. The salvage required a little planning. How exactly does one remove eight limestone (2080kg/m3) columns, each one weighing over 1100 pounds each and bring them safely back to Minnesota? Salvage expert, Andy Swingley said “No problem”...he was pretty excited about this one. Armed with angle grinders, chisels and generators and the aid of a 5,000 lb. extendable boom lift the columns where removed in less than four days. Once on site and after inspection, Andy found that the most logical way to take the entrance way apart was by using hand chisels. In most areas an angle grinders blade was too thick. Beginning with removing the clay tile and wood roof the labor intensive process began of chiseling away the mortar. Working from one side to the other of the structure and top to bottom as the mortor was removed, wooden wedges are inserted and gently used to break apart the joints. Once the joint was broken the lifting slings are inserted so that the lintel or column can be lifted by the boom lift. On day four, the flat bed trailer arrived and the columns were then loaded for transport to Minnesota. Now at our warehouse, these columns are a wonderful thing to see and feel. One notices the subtle slope or barrel rolled shape of each column. The chisel marks normally hidden by the capitals are now in full view. The massive solid lintels at 1700 lbs a piece are bigger or thicker than you would imagine adding to one's appreciation of this sedimentary rock.